We walk into the “joint” and are greeted by the sound of a standing bass and smooth blues as you feel you’ve stepped into a comfy house party. Red feather boas hang from the ceiling of the restaurant and healthy yet agreeable sounds of chatter fill the room where we are to be seated. We peruse the menu and see many a southern favorite (Fried Green Tomatoes, Jambalaya, etc.). What catches our eyes though is the three piece dinner which included one soup/salad, one entrée and one dessert for a reasonable $28. We both went for it with different options. First came a basket with slices of white bread and perfectly-made cornbread (formed in the shape of hearts). 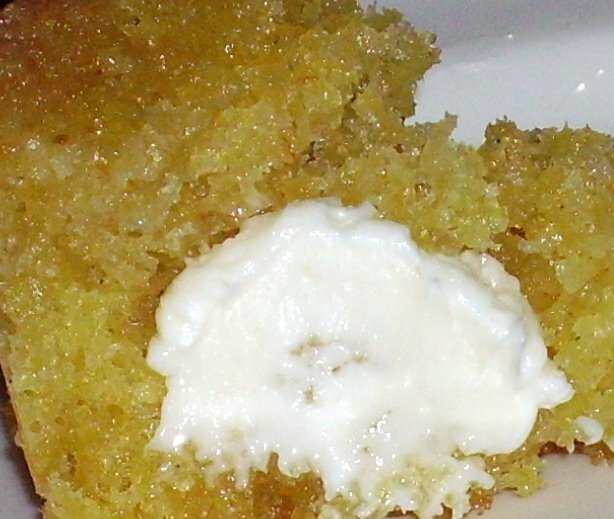 The cornbread was moist and we could not help but ask for a second serving. 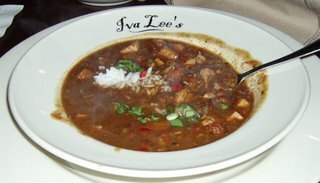 Jay started with the Gumbo, chock full of chicken, anduille sausage and shrimp. The broth was hearty and a good kick of unknown spices added to the soup which could easily pass for a meal. He saved half of it for lunch the next day. Anna Lisa had the Butternut Squash Soup. It was perfect for this time of the year. It was a fairly cool night and a typical autumn soup sounded inviting. It had pieces of toast and what tasted like candied walnuts on top. It was sweeter than I expected, the consistency not too thick but very smooth. I probably would not order it again but don't regret trying it once. For the entrees we went for surf and turf….One of each obviously. Jay had the Grilled Pork Chop. 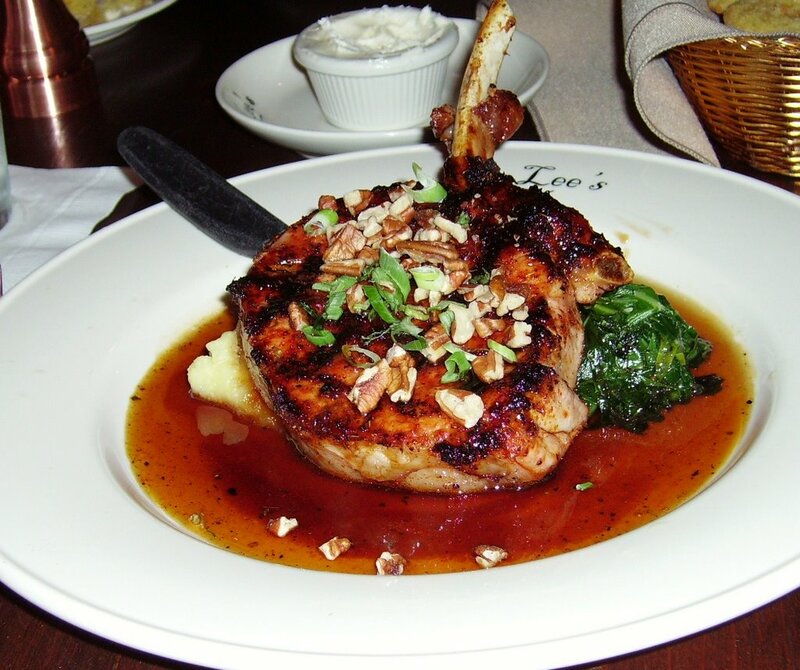 The glaze of brown sugar and pecans, combined with the perfect grilling of the bone in chop made for an incredible meal. He has commented before about pork chops being too lean these days and lacking the flavor of the Midwest chops he grew up on, but there would b e nothing but compliments tonight. The sides of mashed potatoes were a good compliment but the collard greens were a bit bitter for his liking. To save room for dessert this also partially came home to join the Gumbo. Anna Lisa had the Barbecued Shrimp with candied yams. At first, the sauce tasted identical to Jay's but I later realized that it was thicker in consistency. 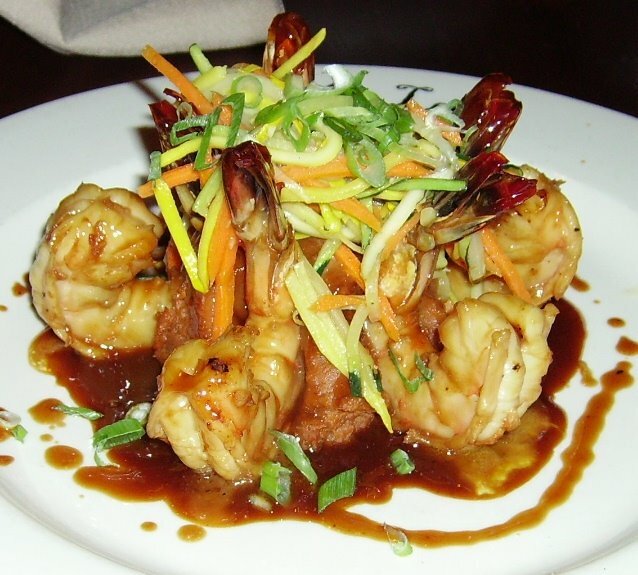 The shrimp were large and topped with julienned vegetables. The sweetened yams were just that, sweet. I had debated between this dish and the salmon and was recommended the shrimp. Overall, not a bad choice but I left the vegetables and yams relatively untouched. Lastly came dessert, fitting it in would be a challenge. 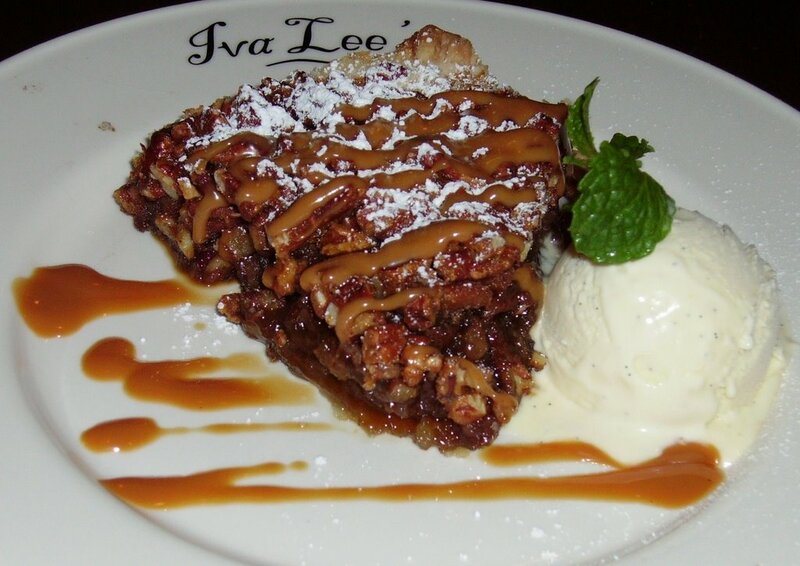 Jay went for the Pecan Pie with French Vanilla Ice Cream. What arrived as a crudely cut slice of pecans was forgotten as the first bite was b rought in. Perfectly sweet and with the compliment of ice cream was a great wrap up. Too much food, as half of this goes home. Jay now looks back and realizes Sunday’s lunch in front of the games is going to be great. 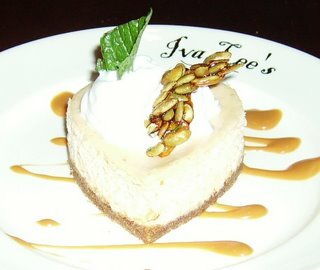 Anna Lisa had the Pumpkin Cheesecake. It was, perhaps, the best part of the three-course meal. It wasn't too sweet and it had a nutty flavor even before biting into it. 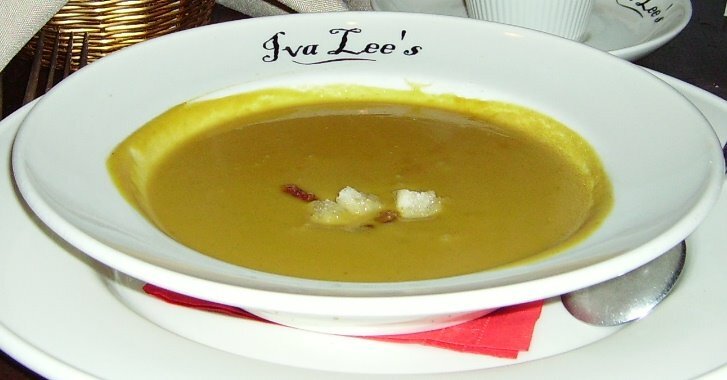 We’ve heard mixed reviews on Iva Lee’s in the past but tonight from us there would be only raves as the food, combined with the ambiance made for a great night. We skipped the wine and Jay had one cocktail and the total with tip was $78. Pretty reasonable to top it off. A great date night place, if you don't mind the blues music. It would be a good place to celebrate a birthday with a large group of friends. We'll be back, but we're not in a hurry.